Last week I talked about 3 alternative ways of researching your family history and I'm going to talk about another today. As you can probably tell; I'm going to talk about newspapers. These wonderful sources can tell you an awful lot of information if a. you know how to use them and b. your relatives are in there. Well lets start with knowing how to use them. There are many sites where you can view old newspapers, but the main one is probably the British Newspaper Archive. To be able to see newspapers there: you will need an account with a subscription or use pay as you go credits. However they have teamed up with Find My Past if you're on there. Another way is to go to the local archives, there they tend to have 'readers' where you can find old newspapers. But with this you will probably have to read the whole paper or have a rough date you would like to look at. Obviously the positives of this is they can be more up to date and not all of the newspapers are on websites yet. Now if they're not in there, there's not a lot you can do, but research another name in your tree! Somewhere in your tree there should be a mention but always try alternative spellings as there might be a spelling difference. So as you can see, they can come in all shapes and sizes. In the first extract it talks about the death of Sarah Gauler née Cosburn. And in the latter, the golden wedding anniversary of Robert William Shire and Alice Doble. 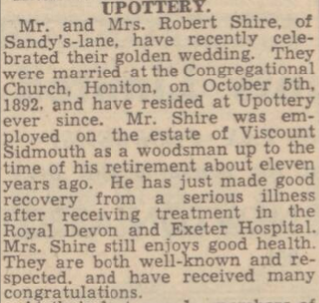 Sticking with the latter we can see the marriage date as 5 October 1892, which is handy as it now gives me something to go on, when I get to go to the Devon Record Office. But this proves don't just look at marriages look out for anniversaries as well. Well that rounds off this week's article quite well and I hope you'll be back next week! If you're related to either Sarah, Robert or Alice feel free to get in touch!